The least expensive, natural way to flush your toilet; using gravity. These types are also easy to maintain and fix. You have to do your research to buy a model that works well. These types have a pressure tank inside that works like a big balloon. When the flush valve opens, pressure and gravity rush the contained water out, creating a powerful flush, without condensation. The downside is these types are more expensive, difficult to repair, and make more noise when flushing. The latest type of toilet; a hybrid, if you will. 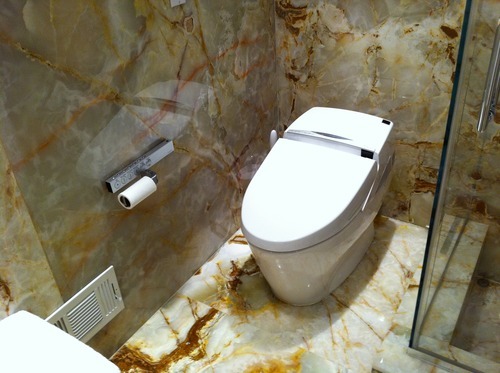 When the toilet is flushed, water exiting the inner chamber creates a vacuum--depressurizing the trapway. This depressurization creates a suction force that pulls water from the toilet bowl into the trapway. During the flush, the trapway is entirely filled with water, which cleans the fully glazed trapway. Easy repairs, a strong flush, and no bowl condensation. The only downside is limited selection, and a slightly higher price.